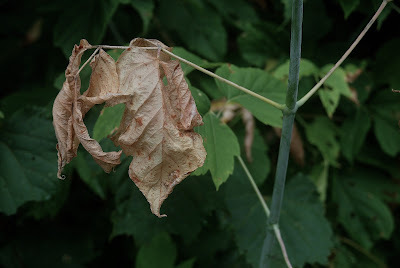 A leaf at the end of its life isn't any less worth observing that it was when it was first a bud, or when it was bursting with green-tinged life in the middle of summer, or exploding into reds and oranges with the onset of autumn. It was August 31st when I saw this particular leaf. Too early for it to die, yet here it was, shrivelled on a branch. I guess it didn't get the memo. Or its calendar and clock needed a reset. Untimely, but very much real. And still very lovely in its own right, its delicate remains hinting at what it once was. Your turn: Take a picture that reflects this week's Thematic theme, old. Post it to your blog or website, then leave a comment here letting folks know where to find it. Visit other participants to share the joy, and feel free to use the Twitter hashtag #ThematicPhotographic to invite others to join in. If you've got more than one pic to share, we encourage multiple submissions through the week, too. Here's where to find more background on how Thematic works. Enjoy, and thanks! When you reach my age 'old' takes on a different meaning. Here is a link that works hopefully. I chose one of my favourite old places for this Thematic Photographic, Delphi in Greece.